When I was a young 5th grade teacher, I chose to base my classroom discipline on the positive rather than the negative. I developed a program with two components. As a class, they could earn Class Coupons. Once they earned enough Class Coupons, we would have a party which generally consisted of watching a movie that went along with a book we were reading. Students could also earn Individual Coupons. I might pass out Individual Coupons for receiving a complement about the student, homework, answering difficult questions, or showing improvement. The Individual Coupons could be used at the party to buy treats: pop, candy, popcorn, etc. I wanted my discipline program to focus on the positive that my students were doing rather than the negative as that was the behavior I wanted to encourage. For that reason, coupons could never be taken away. A lot of surprises came from this program. First, I had a lot of complements from other teachers which earned my class more coupons. The teachers and principal commented often on how well my students behaved as a whole. They motivated each other to do well. Second, when it was party time, they shared their coupons. At first I wasn’t sure this was a good idea, but what I found with a positive system is that students wanted to bring up those who were struggling and share in the overall glory. Lately, I have been feeling like my life needs more discipline. With crazy work hours, I have found that besides walking, I don’t regularly work out. My weight is at an all time high and my joints are feeling more old age than rheumatoid arthritis. While in comparison to many, my processed food/sugar intake is still low, it is higher than I am comfortable with. I want to be healthy and I want to have control over what my body is able to do and what I put into it. So, along with my sister, a new positive discipline plan was put into effect. Here’s how it works. We have started rewarding ourselves for positive actions. We have the potential of earning $1 per day for each action we feel is needed for the week. This week I get a dollar for each of the following: meeting my Fitbit step count, working out, avoiding sugar, and keeping wine to weekends only. So, this could be a $4 a day week. Four dollars a day? This might not sound like a big deal, but it is to me. 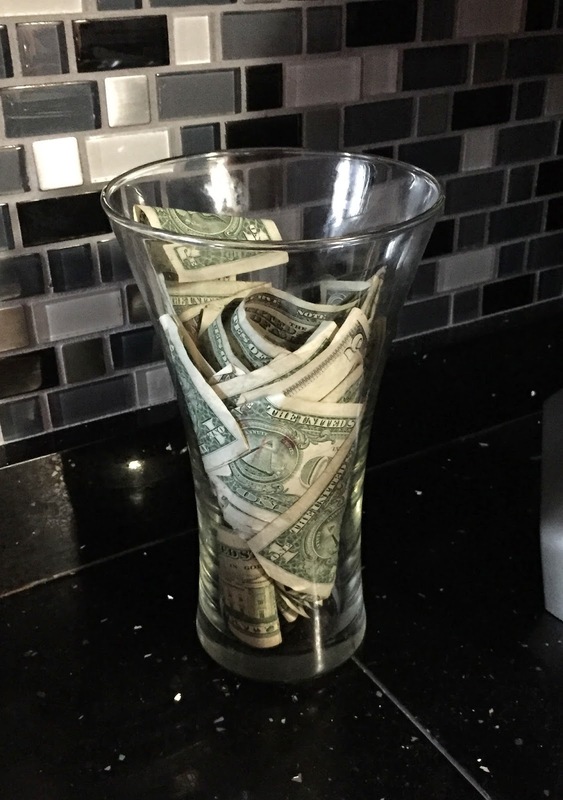 I keep my jar of money on the kitchen counter and it reminds me all day that my goal is health, much like the Class Coupons I gave and hung in the main section of the classroom reminded my students that our goal was to achieve respect and responsibility for our own actions. When I put my dollars in the jar at the end of the day, I feel like I have accomplished something big. And, over the course of three months, my money has the potential of growing and being used for something I want just as the Individual Coupons I gave my students gave them buying power on party day. Focusing on the positive works for me. It motivates me and it keeps me on track. Some days I am not able to accomplish all the goals I want to accomplish, but instead of focusing on what I didn’t do, I like the idea of focusing on what I did do. Some days I am only able to put a dollar in the jar, but putting that dollar in the jar allows me a little time to savor the fact that I did accomplish something great during the day towards being the best me I can be. What about you? How do you motivate yourself to be healthy?